The most likely long-term energy economy will utilize mixed hydrogen/electric means to carry energy to end-use. Hydrogen and electricity are the obvious technological complements because neither electricity nor hydrogen is the best choice for all applications. Today, hydrogen is made mainly from fossil fuels. Natural gas is the primary fossil fuel source, but some is made from petro­leum fractions. Petroleum refining accounts for most of this production. However, coal is the cheapest, nearest-term, large-scale source of hydrogen because coal and water are the basic chemical feed stocks needed to produce coal-derived hydrogen by well understood processes. Nuclear power is the leading intermediate-term source of energy for hydrogen production, either by proven electrolytic means or by proposed, but unproven, thermochemical means. Both technologies require substantial improvement to compete economically with hydrogen derived from coal. Nuclear energy is also a likely long-term source of energy for hydrogen production. Solar energy is a long-term candidate for production of hydrogen as well, either through electrolytic or thermochemical means; ultimately, solar-produced hydro­gen is likely to become competitive with hydrogen derived from nuclear energy. The first chapter of Hydrogen Manufacture by Electrolysis, Thermal Decomposition and Unusual Techniques presents a full survey of a wide range of hydrogen technologies. 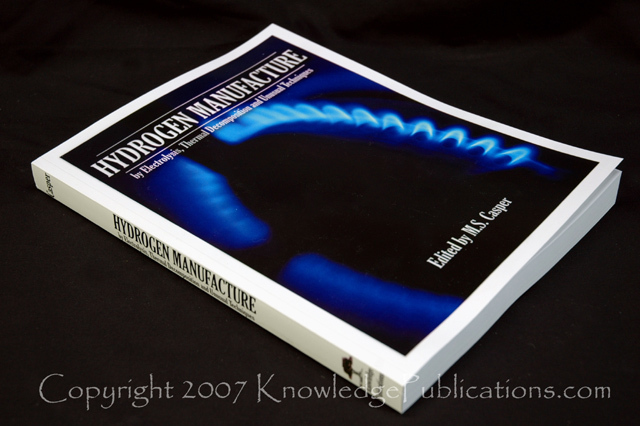 The second chapter encompasses those methods which produce hydrogen from fossil fuels. Water electrolysis, as it might be used in a hydrogen economy, is covered in the third chapter, while the fourth chapter surveys proposed thermochemical means for splitting water to produce hydrogen. In the fifth chapter, more unusual sources and processes which may someday be useful in the conversion to a hydro­gen economy are presented. The sixth chapter provides an overview of the eco­nomics of a hydrogen economy and the final chapter discusses various aspects of hydrogen safety. A complete bibliography of the published source material on which this book is based is also included. The table of contents is organized in such a way as to serve as a subject index and provides easy access to the information contained in this book. Each chapter is followed by a list of references giving further details on these timely topics and the bibliography at the end of the volume lists highly important government re­ports. In its simplest form, a gas producer consists of a vertical brick-lined vessel on top of which is a charging hopper and on the bottom of which is a grate with the air and steam blast distributor plates. A diagrammatic sketch of a gas pro­ducer is shown in Figure 2.1 (12). The fuel bed in the gasifier travels vertically from top to bottom, being consumed in the process of coal gasification. One can divide the bed into a succession of horizontal zones: the ash zone, the combustion (or oxidation) zone, the reduc­tion zone, and the distillation zone. (1) The ash zone extends from the grate upward toward a carbon combustion zone. Air and steam enter as uniformly as pos­sible over the whole section and move upward through the bed. The air and steam cooled ash is removed by continu­ously rotating or intermittently moving the grate. Any clinker formed earlier is crushed. The ash is usually dropped into water-sealed troughs. For proper operation, it is most important that the blast distribution is uniform, that no gas channeling occurs, that no significant quantities of carbon re­main and that the ash does not fuse. (2) The combustion zone occupies a rather thin (about six inches thick) region in which oxygen reacts with carbon in the fuel. The temperature of this zone may reach about 3000°F. In the bottom of the zone the carbon oxidation product is pri­marily carbon dioxide. Near the top of this zone carbon mon­oxide is formed. The temperature must be closely controlled to prevent the formation of large clinker lumps, by the proper proportioning of steam and air. (3) The reduction zone extends for a distance from one to five feet, in which the temperature drops from about 2200° to about 1500°F. Here no significant oxygen remains, most of the car­bon dioxide is converted to carbon monoxide and a signifi­cant concentration of hydrogen is first noticed. Near the top of the zone no significant gasification of fixed carbon occurs. (4) The distillation zone is a zone in which the hot gases from below preheat the coal and cause the volatilization and the cracking of the more volatile coal constituents. The character of the products of the distillation zone depends most strongly on the type of coal fed into the gasifier. The oldest form of industrial electrolysis of water uses the tank electrolyzer in which a series of electrodes, anodes and cathodes alternately, are suspended verti­cally and parallel to one another in a tank partially filled with electrolyte. Alter­nate electrodes, usually cathodes, are surrounded by diaphragms that prevent the passage of gas from one electrode compartment to another. The diaphragm is im­permeable to gas, but permeable to the cell's electrolyte. The whole assembly is hung from a series of gas collectors. A single tank-type cell usually contains a number of electrodes, and all electrodes of the same polarity are connected in parallel, electrically, as pictured in Figure 3.2. This arrangement allows an individual tank to operate across a 1.9 to 2.5 volt dc supply. In general, the cost of electrical conductors increases as the current load increases, but the cost of ac-dc rectification equipment per units of output de­creases as the output voltage increases. This is one important consideration in the design of tank-type electrolyzers. There are two major advantages to tank-type electrolyzers. (1) Relatively few parts are required to build a tank-type electrolyzer, and those parts that are needed are relatively inexpensive. Be­cause of this feature, tank-type electrolyzers tend to optimize at a lower thermal efficiency than do more sophisticated electro­lyzer structures. Therefore, tank-type electrolyzers are usually selected when electric-power costs are at their lowest. (2) Individual cells may be isolated for repair or replacement simply by short-circuiting the two adjacent cells with a bus bar. This feature allows maintenance to be carried out with a minimum of downtime for the entire plant. Figure 3.17 shows the schematic construction of a few cell types. Table 3.3 lists some of the technical data of typical, conventional water electrolysis methods. This insoluble ruthenium complex having the metal atom at the center of three bipyridyl residues and with long octadecyl tails attached to the ring has the unusual property of separating the reactive components of water to form molecular hydrogen and oxygen.